As you consider setting aside 3-6 hours for a freezer cooking session, you may be wondering how this can actually save you time. You soon will see that the time investment pays out handsomely with every meal made. Meals are made assembly-line style and every minute is used during your freezer cooking session, let’s take a look with an example. Think about making a Zucchini Lasagna (recipe). If you make one, you need to slice the zucchini, grill the zucchini, assemble the lasagna, and bake. The whole process takes about an hour to get out the ingredients, follow the recipe, put ingredients away, and clean up the kitchen. When you’re making this recipe there is time between steps where you’re waiting for the zucchini slices to grill and the meat to brown. 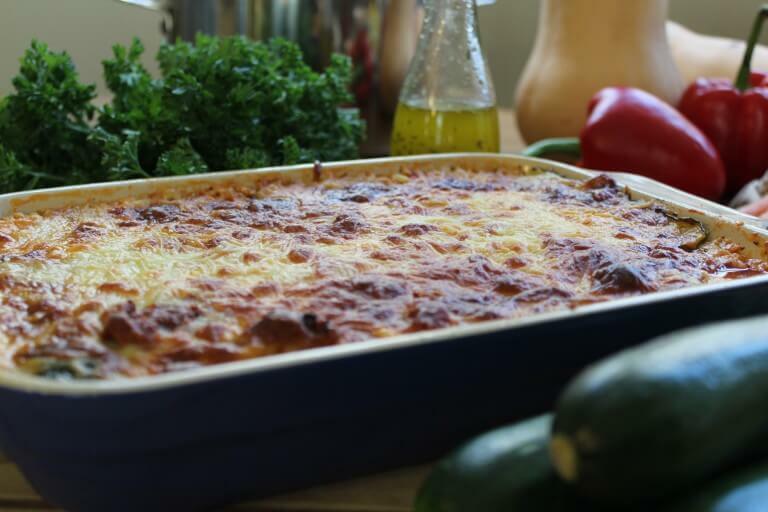 In our Mediterranean Freezer Cooking Session we make 4 lasagnas in just a little over that same hour of time. Not only that, but we also use down time while the zucchini slices are grilling and the meat is browning to roll Veggie-Packed Meatballs (recipe) and cut up Roasted Summer Veggies (recipe in the Freezer Class). Over the course of a few hours these little tricks and efficient use of our time snowball into a full freezer and many many meals to enjoy in the weeks to come. Plan your recipes and have them printed out, grocery shop, and clean your kitchen. Check your grocery list the night before, and double check again to make sure you have all the ingredients needed and all the meat is thawing. Having to pause the cooking session to try to thaw a whole roast or 10 lbs of ground beef stalls the momentum you have going and will extend out your cooking day by hours. To plan what recipes you’re making, either use tried-and-true favorites or batch test a single meals’ worth to make sure your family likes the recipe before you make pounds and pounds of it. When starting, make 3-4 recipes but enough for 4-5 meals each rather than trying to make 12 different recipes. Starting with a clean kitchen means we don’t have to wait to hand-wash or clean off the stove before use. Having printed recipes (or at the very least a screen shot) means that we don’t have to stop what we’re doing because the website we were using is having tech issues or our internet is down. Tip: If you did forget to thaw meat, thaw it in a large bowl (keep it in any plastic packaging, and wrap in another plastic bag for good measure- we don’t want to water-log it) covered in cool-to-room-temp water, changing the water every 10 minutes. This will gently thaw the meat faster than leaving it out on the counter and will be more even than trying to thaw it in the microwave. 2. If something takes a long time to cook and/or cool, start that early on. Examples: Caramelized onions take a long time to cook, so we start that early in our Freezer-to-Grill class. Grilled Sweet Potatoes take 3 batches in the Instant Pot, so we start them early as well. Yogurt (recipe) has to come up to temperature, then cool back down before we can finish the process, so that’s another one that we start early on. 3. If you use something in multiple recipes, start that early in the cooking session. 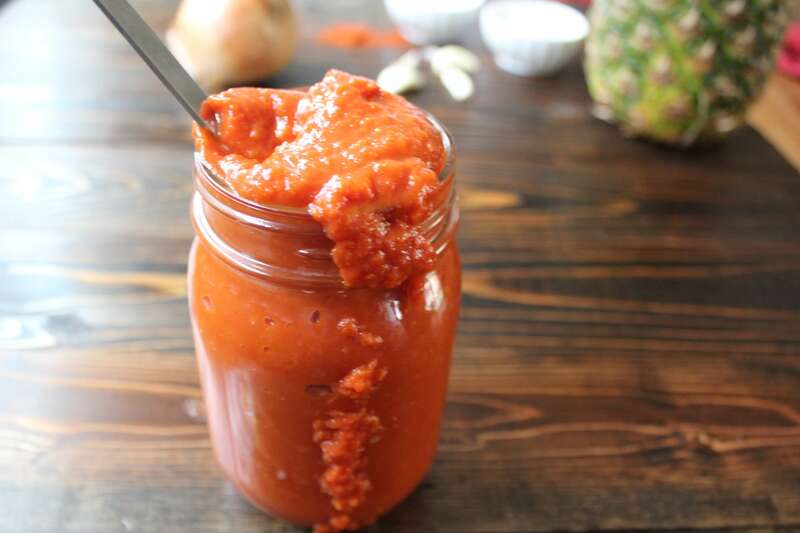 In our Freezer-to-Grill Class we make Easy Homemade Ketchup (recipe), which is also used in Burger Sauce (recipe). By starting it early on, we aren’t waiting for ketchup to finish simmering at the end of our cooking day so we can finish one last recipe. 4. Batch veggies, herbs, and meats separately. Good kitchen hygiene dictates that we need to wash everything that touches raw meats in hot soapy water, and be careful that produce does not touch raw meat. For that reason, we try to work with all our herbs and slice all our veggies before we get the meat out.This means we can chop all our veggies using the same cutting board and knife, make all our marinades in the food processor or blender with only rinsing it in between, and get our ferments going without having to sanitize between each step. When you have meat out and have ‘meat hands’ go ahead and work with as much raw meat as you can during that time, then after it’s all been packaged or is marinading, give the counter a good wipe down, load the dishwasher with your ‘meat equipment’ and work on any lingering produce or finished meals. 5. Make use of every minute. As we’ve seen, we save lots of money freezer cooking, so treat this like important paid work. 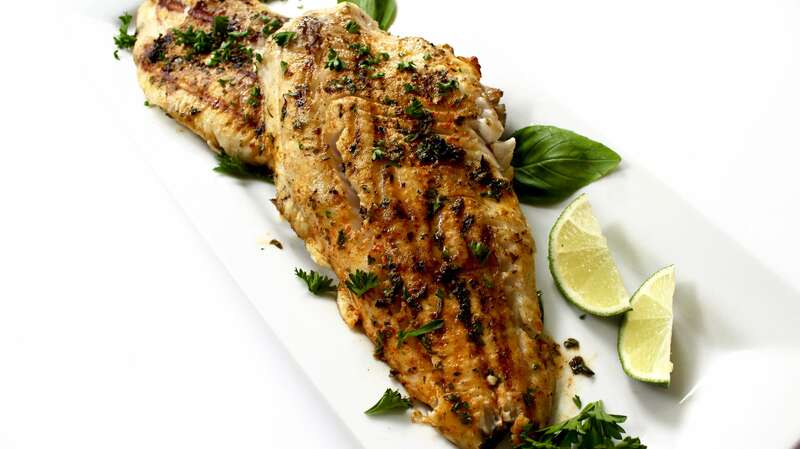 If you’re whirring a marinade in the blender, use that 30 seconds to snip the herbs or wash the produce needed for the next recipe. If you’re browning meat on the stove, continue stirring the ketchup that is also simmering, rolling meatballs, and packaging food that is cool enough to go in the freezer at the same time.If you find yourself standing around and all the recipes are as far along as they can be at that point in time, fill the dishwasher and wash anything that you need to by hand! The key to efficient freezer cooking is to be intentional and active for an entire 2-4+ hour time period. Make sure you clear your schedule, freezer cooking already involves lots of multi-tasking so for the most productive results don’t try to add anything else on top of it. If you’d like to try freezer cooking but have trouble organizing the whole thing, make sure you check out my freezer cooking class (see it here)! I give you step-by-step instructions (video and written) to walk you through the whole thing. This class has resulted in thousands of families having a full freezer and enjoying delicious meals- easily!